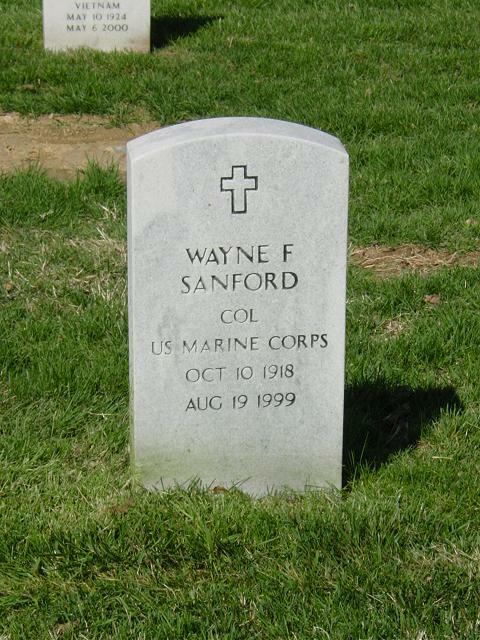 Wayne F. Sanford, 80, a retired Marine Corps colonel who also worked for the Central Intelligence Agency, died of congestive heart failure August 19, 1999 at Inova Fairfax Hospital. He had lived in Falls Church since 1955. Colonel Sanford, a native of Shelby, Michigan, served 29 years in the Marine Corps, beginning in 1939. Stationed in the South Pacific during World War II, he participated in the battle of Guadalcanal and received the Silver Star and two Purple Hearts. He served in Korea and Vietnam during the wars there, then spent the remaining years of his military career on assignment to the CIA. He retired from active military duty in 1968 and continued to work for the CIA until 1973, when he was branch chief of the special operations group. For about the last 30 years, he was active in the Falls Church Republican Party. Colonel Sanford was past chairman of the Falls Church Republican Committee and campaign chairman for state and local politicians. He was also a founding member of the Falls Church Citizens Organization, an active volunteer in the Boy Scouts of America and a member of the board of directors of the Falls Church Scout House Association. Survivors include his wife of 55 years, Janice Sanford of Falls Church; five sons, Michael Sanford of Chardon, Ohio, Daniel Sanford of Thomasville, Ga., David Sanford of Boulder, Colo., Bruce Sanford. contributions be made to Hospice of Northern Virginia, 6565 Arlington Blvd, Suite 500, Falls Church, VA 22042 or the Marine Military History.